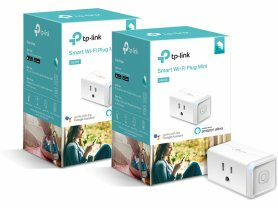 ONLY today - May 9th you can get this TP-Link HS105-2 Kasa Smart Wi-Fi Plug Minis (2-pack) $40.99 (Retail $58.54). *I'm grabbing this for Father's Day*. Nearly half the people in the world who use Wi-Fi networking products use TP-Link. With over 150,000 products shipped daily, substantial investment in research and development, and meticulous in-house design, manufacturing and testing, we're proud to be the world leader in Wi-Fi.